Aristotle offers the epigram for this chapter with the assertion from his Ethics: “For the things we have to learn to do, we learn by doing them.” In turn, this chapter explores what is happening when learning is put underway and ‘conducted’ by an educator who is ‘making music’ with their students. ‘Music making’ is a figurative category used to describe a particular form of dynamic dialogic learning. 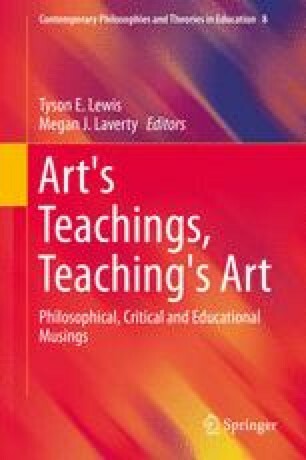 Hence, the aim of this chapter is to offer a phenomenology of the ‘music making philosophical educator.’ One can imagine different types of music making educators, and it is hoped this chapter will inspire others to describe their own musical-philosophical educators. However, the attention here is exclusively focused on describing the philosophical educator as one who puts into motion an improvisational jam session, i.e., one who understands that a philosophical education, or the experiential learning of human freedom, happens through dialogic jamming. The virtues on the other hand we acquire by first having actually practiced them, just as we do the arts. We learn an art or craft by doing the things that we shall have to do when we have learnt it…For things we have to learn to do, we learn by doing them.